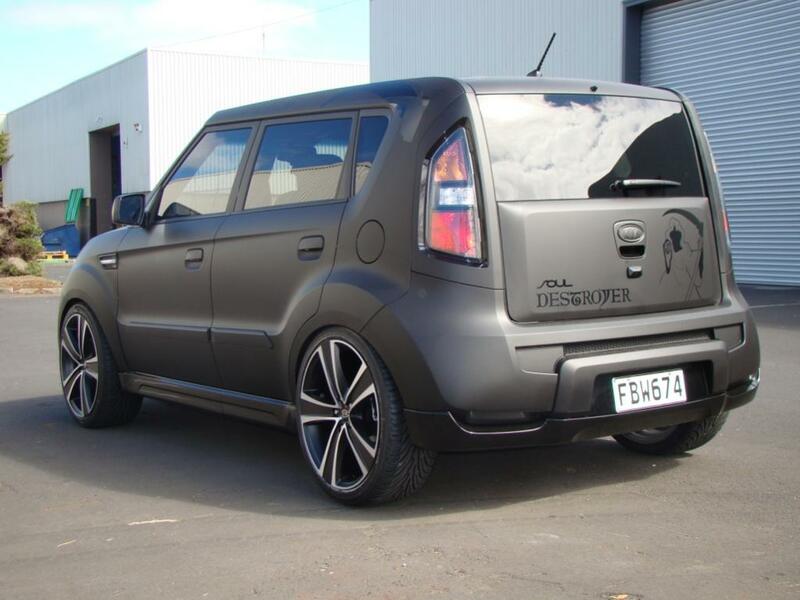 This Soul was built by us at Kia NZ as a promo Vehicle. 20" Rims (different on both sides), Custom Leather Interior, Matt Black Exterior, Body Kit etc. What wheels are those on the second picture!! I'm really digging those!! I like the flat paint job!! !Also is it lowered?Any and all info on the wheels and tires in the second pic!!! !I love the stance!!! Last edited by Slammed; 09-15-2009 at 01:15 AM. The 2 diffrent wheel sets are for commercial use, he said it was for promo use, its so you can shoot the car in diffrent ways quicker. I love the rims in the second picture and the flat paint job as well. Hooray White Stripe, Hooray Denim! The wheels are Mak Fuoco 20" x 8.5". I'll find out for you guys what tyres are it is running on. The car is lowered by 25mm at the front and 40 mm at the rear. The car still rides fine and there is enough room for the wheels turn at full lock without rubbing on the inner guard. Last edited by Rosco; 09-15-2009 at 02:26 AM. Reason: Added info. Haven't seen anything like it - outstanding!! Been liking the flat paints for a while now- looks great. Now, is it like the Lambos where they have talcum powder in the flat paint and each time you wash it, it actually gets shinier? ;-) Love the fact that you can pay such a rediculous amount for a paintjob on an already expensive car, and then be told NOT to wash it! Yeah, your kid might be an honor student, but are they ready for the Hamster Revolution? That is actually a mean assed Soul. I like it, I like it alot.